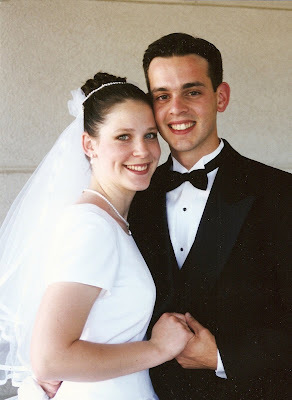 No it's not my blogiversary yet, but it is our Tenth Wedding Anniversary! I woke this morning to Ryan's goodbye kiss as he was going out the door to work and found a card to me on his pillow. He has always been able to pen such sweet notes to me, even when we were dating. I, on the other hand, am terrible at it. Since I don't have time today, on Monday I will answer Lisa's tag, but instead of anwering about me I will give 7 random facts on my man. You don't look like you've aged a day! Hubby on the other hand... well he's just matured a bit :) Happy 10th! Our 10th was last weekend and we just managed to go on our Anniversary date last night. But your weekend in Tahoe sounds like more fun! What a darling picture!! You are just simply beautiful. Really!! Happy Aniversary! I hope you guys have a good time!! Congratulations on joining the ranks of being married for 10 years. You both still look great. Can you believe how fast 10 years go by? Tender! Hope you had a great time this weekend! You were a beautiful bride! Congrats! 10 years, that's awesome!! Happy Anniversary! What a sweet hubby! Congratulations! Sounds like you had a wonderful anniversary. Hope you had a great anniversary!! I was searching around the blogs and am so happy I found you guys!! We also have a blogspot it's mcallisterlife.blogspot. Anyways, it was so good to see your blogspot and how your family has grown!! What fun!! I can't wait to show Richard! I think it's time to update! Ten years already! Happy Anniversary, and happy blogiversary whenever it happens. And by the way: yes, I did see your mom up here in Canada. We had a brief moment where we just stared at each other, like, "What are YOU doing here?"